No matter what you're serving as the main dish, sides are sometimes the best part of the meal. Looking for the perfect ones to add to your Christmas menu? From creamy mashed potatoes and cheesy scalloped casseroles to a top-rated cauliflower recipe and make-ahead dinner rolls, these fabulous are so delicious, your family will ask for them year after year. 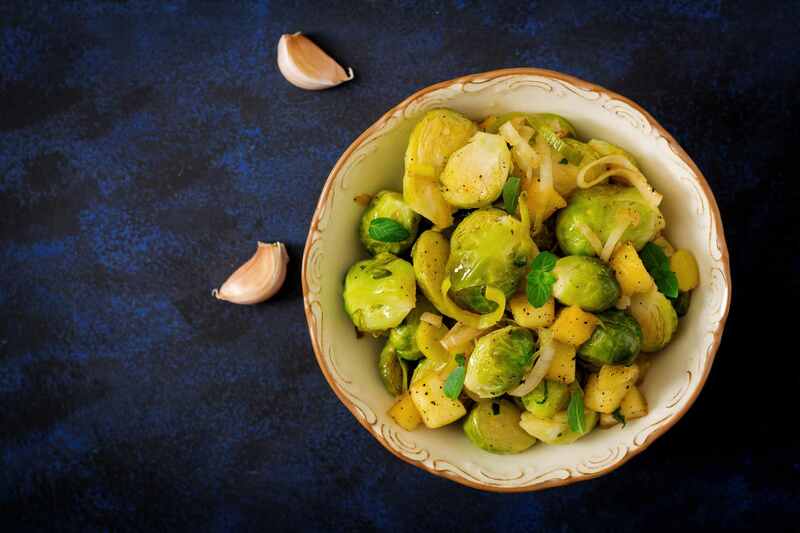 Even picky eaters will enjoy these buttery Brussels sprouts, caramelized with slivers of garlic and fresh lemon juice for added zing. This elegant risotto is a fabulous combination of sweet potatoes, pecans, and Parmesan cheese. Add an extra knot of butter right at the end of cooking to super-charge the creamy texture. Tender-crisp green beans are tossed with sauteed onions and toasted breadcrumbs flavored with Middle Eastern za'atar seasoning in this twist on a classic. These puffy soft yeast rolls with crispy edges are a Christmas dinner essential for soaking up gravy and sauces. You can make them a day ahead and simply reheat in the microwave prior to serving. Perfect mashed potatoes are a holiday must-have—all you need is lots of butter, salt, pepper, some milk, and a masher. For the fluffiest results, use higher starch potatoes such as Yukon Golds or Russets. Crumbled bacon and maple syrup give this special-occasion cast-iron cornbread amazing flavor. The sweet glaze on top is the perfect finishing touch. A butternut squash stir-fry looks pretty on your holiday plate and smells fantastic while cooking. When you hear the mustard seeds popping in the pan, it's almost eating time! Sweet winter pears are a great flavor match for sharp and salty gorgonzola cheese in this elegant side salad. Roasted walnut halves add the perfect crunch. Wow your guests with an impressive side dish that's doubles as a special way to enjoy spinach. To achieve a light and airy souffle, use room temperature eggs and fold them in gently—don't overmix! This old-fashioned British casserole is creamy and budget-friendly. Drained canned peas are layered with boiled eggs, cheddar cheese, and condensed soup under a crunchy cornbread topping to form a delectable holiday dish. Here's a fabulous traditional chestnut stuffing for Christmas that you can bake in a casserole dish or inside a bird for a perfect side dish with turkey or chicken. A well-seasoned Parmesan cheese sauce flavors this scalloped potato casserole. Russets are a great choice for this dish as their high starch content will boost the creaminess of the sauce. A down-home Christmas calls for a side of collard greens. This recipe treats them cooks them down the traditional way, flavoring greens with smoked ham hock, onion, and red pepper flakes. Buying clementine oranges for Christmas stockings? Reserve a couple for this lovely salad with green beans and feta cheese. You can cook the beans and marinate them in the dressing up to two days ahead, then add the citrus and cheese just before serving. Leek and potato soup is a favorite warming bowl enjoyed in Britain at holiday time. Serve it as a first course at your traditional Christmas dinner. Whether you prefer ham, prime rib, or roast beef for Christmas dinner, these simply delicious brown sugar-glazed carrots make a wonderful accompaniment. Corn casserole is a popular Southern side that can be made with frozen or fresh veggies. Your guests will rave about the buttery cracker crumb topping that's incredibly easy to make—all you need are crushed saltines. Rosemary, garlic, olive oil, sea salt, and cracked black pepper are all it takes to elevate roasted potatoes to party-worthy. Bonus: This dish is vegan-friendly and gluten-free, too. Dress up baked ham and pork with this festive holiday side. Caramelized red onions and thyme provide the perfect flavor balance for fresh seasonal apples and pears. Colorful and nutty-tasting—with dried cranberries and walnuts for flavor and texture contrast—this healthful rice pilaf gets a sweet zing from orange juice. Stuff leftovers into a baked squash as an easy winter lunch. Bacon elevates skillet green beans, turning them into a tasty side dish that might just disappear before it's gone once around the table. Crispy crumbled bacon and sliced onion add flavor to these tender roasted potatoes seasoned with thyme and just a bit of olive oil. You can cut up larger potatoes or use halved baby potatoes for this recipe. Creamed spinach tastes extra special when it's made with creamy Boursin cheese. Red onion, Parmesan, and nutmeg add festive flavor to the classic holiday side dish. Cinnamon brings out the nutty sweetness of roasted butternut squash that's caramelized with maple syrup. This vibrant holiday side tastes great served hot or at room temperature. Plump juicy cranberries are spiked with red wine, cayenne and cinnamon, then simmered with orange juice and zest to form a winning sauce you'll want to smother everything on your plate with. Bacon drippings wilt the spinach in this savory side salad that includes crumbled bacon pieces and red onion for festive color and great flavor. A little maple syrup and orange juice jazz up these buttery mashed sweet potatoes that taste great alongside your holiday ham and pork dishes. Top them with a sprinkle of cinnamon for a warming fall touch. Southern cornbread salad is a great reason to make an extra batch of bread this Christmas. Here, it's tossed with bacon, cheddar pinto beans, and veggies in a creamy ranch dressing. The tangy, deep flavor of aged balsamic vinegar is a wonderful way to enhance roasted vegetables. This side dish pairs especially well with roasted meats. Your family will devour these soft and fluffy sweet potato dinner rolls. Make and freeze them up to a month ahead and simply thaw overnight before serving. Does your Christmas dinner menu feature ham, roast beef, or corned beef? Pair it with a hearty cabbage side that's flavored with leeks and bacon to make it celebration worthy. Serve drizzled with cider vinegar to balance out the richness. Gratin Dauphinois is a garlicky, creamy potato dish from France. Make it with soft floury potatoes that will soak up the sauce, such as Idahoes or Russets, and serve it with your Christmas roast. Store-bought puff pastry is the secret to this no-fuss vegetarian strudel. The creamy filling is made with meaty mushrooms, fresh spinach, silken tofu, cream cheese, and tahini. Slice it up to enjoy as a side dish or serve whole as a meat-less entree. This red salad looks as festive as it tastes. Roast the beets a day in advance, then slice and combine with salad and dressing ingredients when ready to serve. It wouldn't be Christmas without a green bean casserole for many families. This recipe is saucy and creamy, but completely vegan and egg-free, so all of your guests can enjoy it, regardless of dietary preferences and needs. Hearty rustic mushrooms are sauteed to perfection with butter, olive oil, garlic, and parsley in this traditional steak dinner sidekick. It tastes fantastic on the fork with roast beef or pot roast. Roasting cauliflower brings out the florets' naturally nutty flavor, enhanced in this recipe with Parmesan cheese, garlic, sea salt, and a dash of olive oil. This British-inspired cauliflower cheese is traditionally accompanied by roast beef. It also freezes beautifully for a great make-ahead holiday meal. Turnips become soft and tender in this roasted vegetable side, which can be seasoned with whatever fresh herbs you like. It pairs especially well with roasted chicken or turkey. These cheesy potato puffs start with an easy mash so it's a smart way to use glam up leftovers. Then, you fold in Marmesan, cheddar, and chives, drop the rounds onto a pan and bake until puffy and golden. Orchard-fresh apples shine in this light and crunchy salad with a subtle licorice flavor from fennel. Save yourself some prep time by using a mandoline to julienne the ingredients. Three ingredients are all you need to this ruby red relish: fresh or frozen cranberries, a fresh orange, and sugar. Enjoy with your holiday bird. Frozen or canned corn is used in this fantastic scalloped gratin. Use a colorful mix of red and green bell peppers in the casserole for an extra festive presentation. Chestnuts pop up at everywhere around Christmastime, making it the perfect occasion to enjoy this vegetarian and vegan recipe for traditional roasted chestnut soup. Delight your guests with this pilaf-style side dish that isn't rice at all. 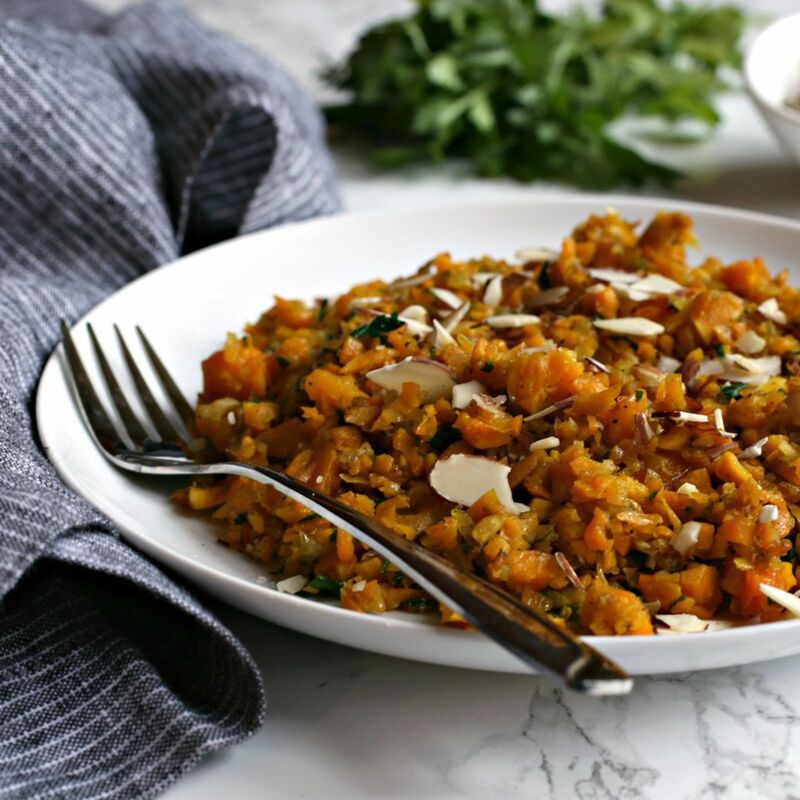 It's actually nutrition-rich butternut squash riced in the food processor and sauteed with onion, aromatic spices, and almonds. A cheddar cheese sauce flavored with dill, pimientos, plus a cracker crumb topping, make this cabbage casserole easy to prepare. Serve it for the holidays with a ham dinner, corned beef, or pork. Here's a creamy, crunchy side salad that adds texture and flavor your to Christmas dinner plate. Soft, shredded brussels sprouts combine with chickpeas in a tangy lemon tahini dressing. Roasting Brussels sprouts combine nicely with sweet pears and toasted walnuts in this seasonal side dish infused with balsamic vinegar. It wouldn't be an old-fashioned Christmas without chestnuts! These bake in your oven in about 20 minutes and make a special side dish for your table—or a fun snack as your open presents. Fresh and dried ginger add a kick to this sweet and creamy squash soup. Top serving bowls with a dollop of sour cream or creme fraiche for a pretty presentation.